For reasons unknown, this year I am really noticing birds. I don’t know why I didn’t see them before, but now I see them everywhere. I am making an effort to get to know them, starting with the ones that visit my yard. I would like to know their names, where they came from, what they eat, and the things they do for us that we probably don’t realize. This spring I was throwing some sticks on the brush pile in the back yard when I noticed the most striking bird feeding on the ground. She paused to look at me and then continued jabbing at the ground. I ran to grab my camera and capture this unusual sight. 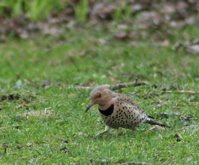 It was a female Northern Flicker, and she was feeding on ants in my lawn. Flickers are a type of woodpecker, different in that they spend some time feeding on the ground. Like woodpeckers, they can be heard rapping on dead trees. They have a long tongue that curls inside its skull until needed to shoot out and catch ants (three inches past their beak!). They eat more ants than other birds, and a single Flicker was found with 5,000 ants in its stomach. Flickers also eat other insects, fruits, and acorns, as well as suet, raisins and apples at feeders in cold months. 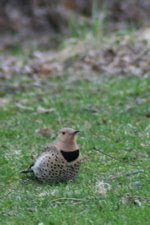 The Flicker was a larger bird (about 12” long) of light brown color with a red crescent on the back of her neck, and a black ‘bib’ on her chest with black spots underneath. Males (and young) have a noticeable black ‘mustache’. In flight, the Flicker has a white rump, until it lands and virtually vanishes against the bark of a tree. Flickers used to be more common in backyards, but declined after people began killing their prey with lawn pesticides. As more and more people practice natural gardening and lawn care, Flickers are finding our yards a more welcoming habitat. I like to think the female Flicker would enjoy nesting in my yard (I even left some dead parts of trees for her! ), but I haven’t seen her around in a while. Hopefully she wasn’t too put off by my staring at her with my big zoom lens. It was amazing to witness her feeding in my lawn, and I’m glad for the opportunity to watch such a beautiful bird in action.